Crescent Boat Club was organized in 1867 when the Pickwick Barge Club and Iona Barge Club merged membership. The Club incorporated for the purpose of healthful rowing and gentlemanly fellowship, and received a charter from the City of Philadelphia to do so along the river, below Lemon Hill, on part of an estate that eighty years earlier had belonged to Robert Morris, signer of the Declaration of Independence, and principal financier of our Revolutionary War. 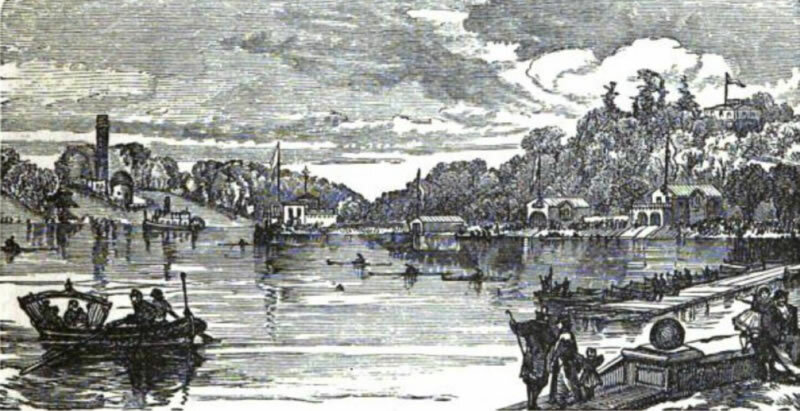 Crescent went to work and built a substantial building to house the boats that was completed in 1868.
ex “Fairmount Park”, Charles Keyser, published in 1876. Lithograph from late 1860’s shows Crescent Boat House with two bays. Crescent rowed out of upriver bay, Penna Barge, the downriver bay. They shared the simple gabled building housing their boats. Soon after the turn of the decade Crescent and Pennsylvania expanded the building. The enlarged building had three boat bays on first floor, and lockers and reception rooms above. The Crescent tower was built, and also a campanile, or a large skylight, above the locker room. By 1871 Crescent had expanded. The street-side tower had been erected overlooking a gabled mansard roof. The boathouse graces the riverbank below the Steel Observation Tower, a Centennial construction that was removed in 1880. This 1871 construction was designed by well-known architect, Mr Davis Supplee. He was a rower, and a member of the Crescent Club. When present-day club members were renovating the interior of the building in early 2012, they discovered a section of stairway, hidden behind the bar, that had led up to the (at that time) roof and the campanile. Also discovered was structural steel beams. It was during these years of the last quarter of the 19th century that builders were beginning to take advantage of the great strength of steel. In Paris, they would show off the Eiffel Tower. Here in Philadelphia, this Centennial Observation tower. Such construction presaged the urban skyscrapers that would soon be built. In Crescent boathouse, the cast steel spans the boat bays, still, and carries the weight of the masonry walls above. 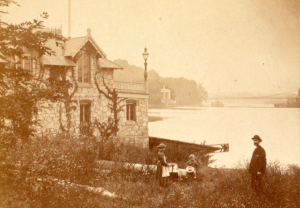 In old photo below, of a family standing beside Crescent Boathouse, just visible in the distance is the old Spring Garden St. bridge, an early steel suspension structure spanning the Schuylkill from the City to the village of Mantua. Family standing beside Crescent Boathouse in late 1870s. Downriver, the old Spring Garden St. suspension bridge is visible past the Waterworks. By the end of the 1880’s, the club’s growth, the city’s growth,and the growth of rowing as a pastime, necessitated further enlargement of its building. Crescent engaged renowned Philadelphia architect, Charles Balderston. He suggested raising the roof, adding another bay for the boats, and revamping the exterior’s mid-Victorian gothic detailing to a now late Victorian Era fashion – post and beam neo-Tudor with soaring highly detailed brick chimneys and eyebrow windows in the roof. This Balderston vision was realized in 1891. Aside from a small enlargement of the downriver boat bay done in the 1960s to accommodate the storage of the over sixty-feet long Eight-oared shells, Balderston’s work survives and is the current footprint of the building. 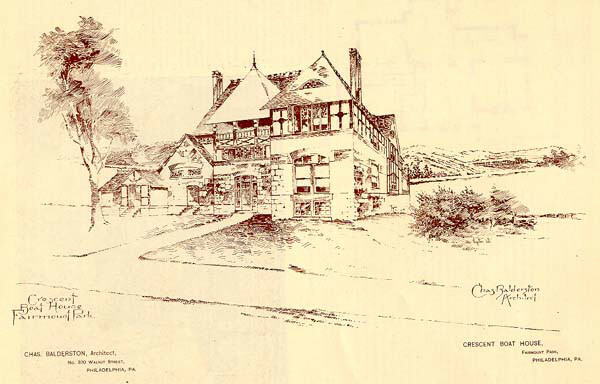 The architect, Balderston, made this preparation sketch for the 1891 expansion of Crescent Boat House. The Balderston wing was built on soft soils. Nearly all the boathouses along the row built in the later 1800’s were built with pilings driven into the soft alluvial soils created after the Fairmount Dam and waterworks had been erected. 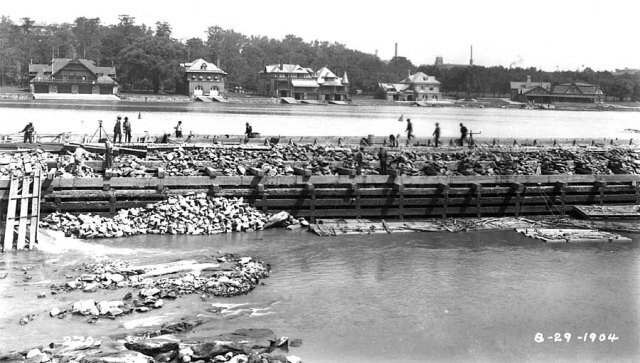 The very impoundment that was the source of so much public good in Philadelphia – diminishment of the summertime yellow fever outbreaks, protection of pure drinking water, pumped up to the Fairmount Reservoir then delivered by gravity within pipes to each house in the city – slowed the river’s current. This damming, and the City’s acquisition of farms in the watershed which occasioned the formation of the largest park within any city, led to the buildup of silty soils along the riverbank on which the later boathouses were built. The boathouses slipped into the river, almost as easily as the oarsmen slipped boats into the river. Fairmount Dam was built in 1822. In 1904, when this photo was taken, the dam required repair. Crescent is seen in center background. Crescent’s latest expansion tipped downward at the river side. The settlement eventually stabilized and building stopped moving. In the Balderston wing, members can put a marble on the reception room floor and watch it roll down the floor, descending nine inches from one side of the room to the other. For years and years, the crooked boathouse stayed steady. In the later decades of the twentieth century, ground water levels changed beneath the city, anti-pollution efforts worked to cleanse the river, and with the increased clarity and the increased oxygen levels of the Schuylkill’s waters, the foundation pilings began deteriorating again, and the building is once more tilting. The Club members are presently mounting an effort to protect, preserve and restore the old building out of respect for its history, and the hope that it can continue for another hundred and fifty years to be a place for Philadelphians to row, enjoy the river and one another’s friendly companionship. Crescent rower bringing gig down ramp to the river. This late 1890s photo shows the boathouse after Balderston expansion had been completed, and before Penna Barge raised their roof to add their own third story. Note Crescent’s third story porch, eyebrow window, and tall flagpole. You might notice that PennaBarge has their laundry out drying – always a prissy bunch them! The club joined the Schuylkill Navy in 1868 and later incorporated in 1874. Rowing was growing in popularity not only as a participant sport, but also as a spectator sport. In the 1860’s and through the end of that century rowing developed as a commercial enterprise – large crowds of spectators, bets and wagers, prize money for the rowers. In some ways, the clubs that banded together as the Schuylkill Navy were attempting to preserve some space in the sport would allow for competition without the professionalism that had been taking over the sport. This dynamic would play itself out again and again – in the Olympic movement of the early part of the 20th century, to pay or not to pay college football players; to allow NBA players in Olympic basketball competitions; to subsidize elite athletes in any sport – how much does it cost to be the best at anything , how do we motivate the effort that excellence requires, and who bears the cost. The club chose to be a place for amateurs, joining with the other clubs in the Schuylkill Navy, to espouse those ideals of sport, and then joining the National Association of Amateur Oarsmen (now USRowing). The NAAO was the earliest sports association to articulate the ideals of amateurism – writing this in 2012, writer cannot use the word “amateurism” without its meaning of ‘bush-league’, ‘second-best’, adhering. This wasn’t so in Theodore Roosevelt’s America. So Crescent remained a group of amateurs (amo -amas-amat for those of you with a bit of Latin – “love”), rowing for the love of it. This had some high class/working class implications in the 19th century. Only the affluent could afford such a pastime, the time for leisure, and the surplus wealth to afford recreational boats. There were men who were fine rowers whose day job was rowing pulling boats, barges, along the Schuylkill and its commerce laden canals. They were declared ‘professionals’ also, and there is no evidence that they were very welcome in Crescent during those years when its membership was architects, doctors, men of the law and commerce. 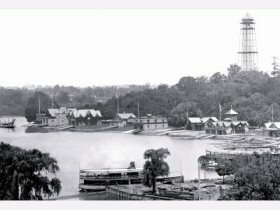 It would be in the next century, early in it, when Boathouse Row and its clubs opened up to the working classes, then later in the 20th century, to women and people of color. The name Kelly (PennAC and then Vesper) is known to most Philadelphians, but John B. Kelly was just one of a larger group of men who were great rowers in their prime, and then great advocates of expanding the opportunities for the sons of new Philadelphians to come onto the river; opening up the river and rowing to the rowhouse kids and sons of immigrants, and the high schools they attended. Bear Curran, John Wilkins, Paul Costello, Charles McIlvaine throughout the 1930’s and into the war years developed and coached school programs expanding the sport of crew, and Philadelphia’s central place in it. John Wilkins was Crescent’s man. After his competitive career, he built and coached students from Father Judge High School within Crescent. His wife was one of the founders of Philadelphia Girls Rowing Club. John lived on until the late 1990’s and mentored Crescent’s present white-hairs back when. 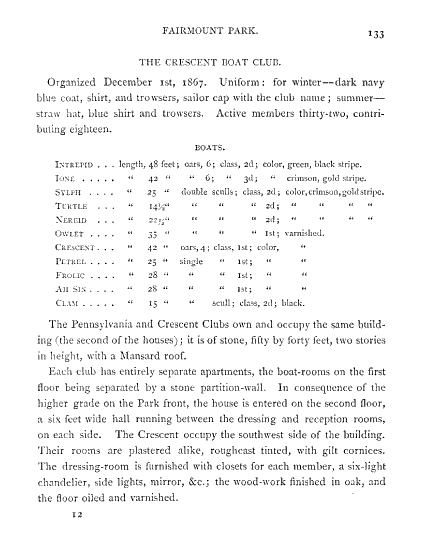 In addition to many victories celebrated by the club, one early notable rowing event involving Crescent was the first time locally that an eight race was held (at the inaugural National Regatta in Philadelphia in 1873). It is reported that Crescent won by ¾ of a length over Undine and West Philadelphia (Penn AC) boat clubs. Crescent remained an active and competitive club through the early 1940’s. 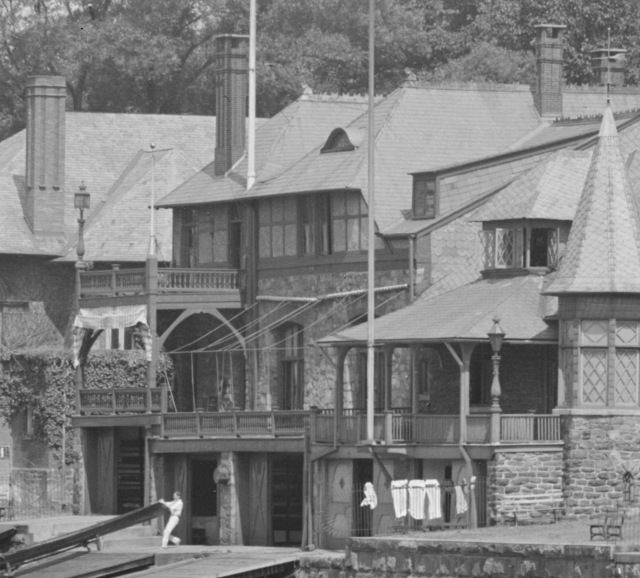 However, because of declining post-war membership, Crescent turned the operation of the boat house over to LaSalle (College) Rowing Association from 1951-1960. After LaSalle vacated the house, John Wilkins, President, and member of Crescent since the 1920’s invited Tom Rafferty to bring his high school rowers to the Crescent. Tom Rafferty and Steve Neczpor became club members and brought their crews into the club as student members. Raf had been coaching a crew of young high schoolers who were rowing off a precarious dock from a warehouse in Manayunk. They brought their boats to #5. The roof was leaking, the floor joists sagging with rot, trophies, and cups and medals had gone missing along with the furniture; windows were without glazing, feral dogs lived in the boat bay. Little of what Keyser had written about in 1875 remained – some of the ‘roughcast tinted plaster’ but none of the cornices, ‘gilt’ or not. While Tom coached, Steve began to stabilize and strengthen the building. Tom Rafferty congratulating Bob Coco, coxswain and Dave Ragan after their victory in the Pair-with. Rowing for Raf, and building for Nez, were David Ragan, the Kealey brothers – Joe and Tom, Tom Daley, Bob Coco, Dave Serdar, Curt Goldacker. They rowed in the mornings and fixed the boathouse on weekends and after the regattas. Rafferty, a plumber by trade, would ‘rescue’ materials from job sites, and slowly the house got equipped with central heating, flush toilets, interestingly tiled showers, steel I-beams, and an assortment of doors, windows and light fixtures. Recently, this writer was turned down by Philadelphia’s Historical Commission for a permit to replace a window in the boathouse – they don’t ((yet) think it their job to preserve the ‘architecture’ of well-known Philadelphia plumbers. But the club does recognize that the twentieth-century history of the club calls for preservation, as well as respect. Were it not for the efforts of such as Nez and Raf, and the young men they taught, the building would be in, rather than still alongside, the waters of the Schuylkill. Since the 1970’s Crescent has experienced membership growth through novice, junior and masters programs. In particular, our junior program continues to flourish with many summer-time victories and solid representation at the Canadian Henley. Crescent is proud to currently host Roman Catholic High School and Philadelphia University crew programs.